Bush: As a European power, Turkey belongs in the EU. Was French President Jacques Chirac justified in taking U.S. President George W. Bush to task over his Turkey/EU comments? ISTANBUL, Turkey (CNN) -- U.S. President George W. Bush has repeated a call for the European Union to admit Turkey, despite criticism by France's President Jacques Chirac that he was meddling in EU affairs. Bush said Tuesday that Turkey belongs in the EU and that Europe is "not the exclusive club of a single religion" in what amounted to a rebuff to the French leader. In an address at Istanbul university, Bush refused to back down in the face of Chirac's criticism that Bush had no business urging the EU to set a date for Turkey to start entry talks into the union. He said that Turkey was moving rapidly to meet the criteria for EU membership. 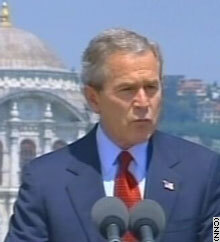 "America believes that as a European power, Turkey belongs in the European Union," Bush said. Turkey was a bridge to the wider world, Bush said. "Your success is vital to the future of progress and peace in Europe and in the broader Middle East," he said. He said that Turkish EU membership would be a "crucial advance" in relations between the Muslim world and the West because Turkey was part of both. The main message in the U.S. President's speech was a bid to mend relations between Muslims and Americans that were left tattered by the Iraq war. "We must strengthen the ties and trust and good will between ourselves and the peoples of the Middle East," he said. Bush held up Turkey as an example of a Muslim democracy. "Including Turkey in the EU would prove that Europe is not the exclusive club of a single religion, and it would expose the 'clash of civilizations' as a passing myth of history," Bush said. Chirac took Bush to task Monday over his call for Turkey's admission to the European Union. "If President Bush really said that in the way that I read, then not only did he go too far, but he went into territory that isn't his," Chirac said of a remark Bush made over the weekend. "It is is not his purpose and his goal to give any advice to the EU, and in this area it was a bit as if I were to tell Americans how they should handle their relationship with Mexico." Turkey has been keen to use this week's two-day NATO summit in Istanbul to showcase its credentials as a westward-looking democracy before December, when EU leaders decide if it has met the political criteria to be put on the formal road to EU membership. Countries such as Germany, Italy and Britain strongly back Ankara's bid, but Chirac's government has expressed wariness about kicking off a formal process to admit the relatively poor country of 70 million people. Bush's verbal spat with Chirac threatened again to upset relations with France, which leaders on both sides of the Atlantic had been working to mend. Chirac was one of the most outspoken critics of the U.S.-led war in Iraq, but France recently approved a U.S.-backed U.N. resolution recognizing the new Iraqi authority. On Monday, NATO -- of which France is a prominent member -- agreed to Iraqi interim Prime Minister Ayad Allawi's request to provide training to Iraqi security forces.